Do you have a nail art bucket list? I do! One of which is to paint leaves. I know, it may sound simple. But somehow, I never got around it until a few days back. And I did so by accident because initially, all I wanted was to paint using a gray and apple green combo. The idea was just to use circles and just work with those colors. But as I started painting with the green color, my brush slipped. I was about to erase it when the thought of painting leaves suddenly popped. Why not?! Has something like this ever happened to you while you are painting your nail? I mean, you intend to do one thing and end up doing another? Isn't it crazy? But I am not complaining with this particular "craziness" because I really liked the results. It's simple, easy to do, and classy. For base, I chose a charcoal gray polish -- Dazzle Dry Joan's Armor in 2 coats. And I painted the design using acrylic paints and nail art brushes that I recently acquired from Born Pretty. Review and link for purchase can be found here. 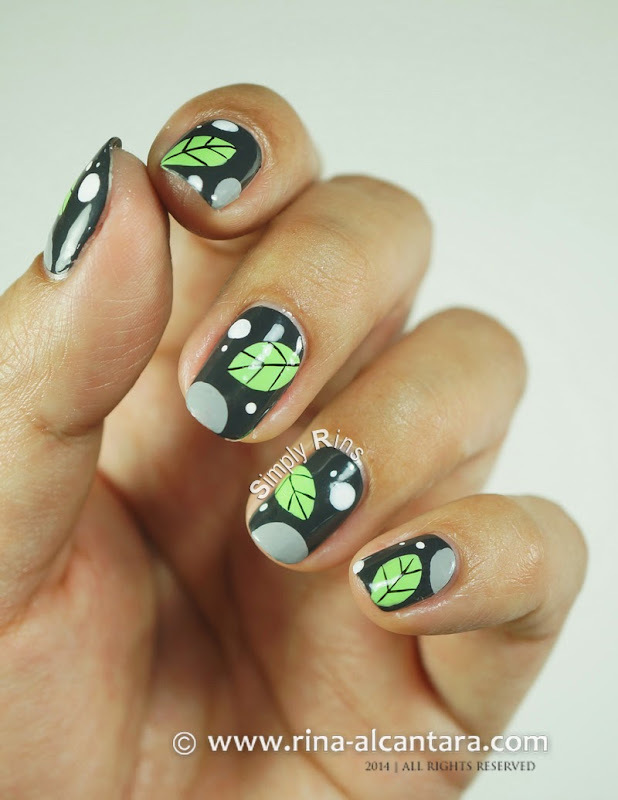 As the title suggests, I painted a single leaf on each nail accompanied by a light gray big circle and a few random very small dots. I think that it complemented the leaf really well. Maybe if I had a bigger nail bed, I'd probably would have painted more leaves. I think that would look great. But my small beds will have to be satisfied with having a leaf instead. 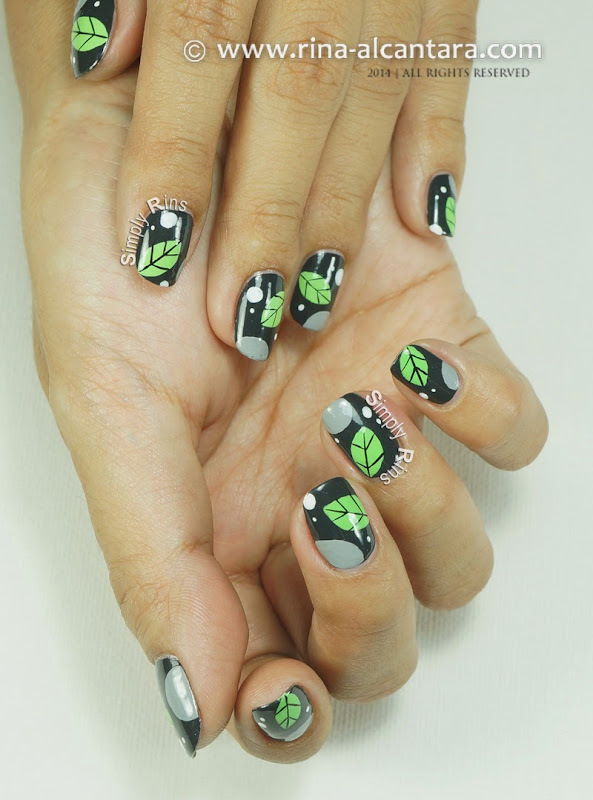 Have you been inspired by leaves for a nail art design? Bottom line, I really liked this color combo and the leaves were a bonus. How about you? What do you think? These are great. And as a person who has a small nail bed herself, I can sympathise with you regarding how much art to do on each nail. Tried more than I should have the other day and the results were a disaster, then I broke one of my best nails, so I had to file the others off, too. Then, went shopping, and by the time I got round to doing my nails again I had three more breaks, so I now have three nails with patches and 7 more that are shorter than they were 3 days ago. Oh, well, back to the drawing board. Thanks for sharing your designs with us so that we can try them too. Hugs!! !